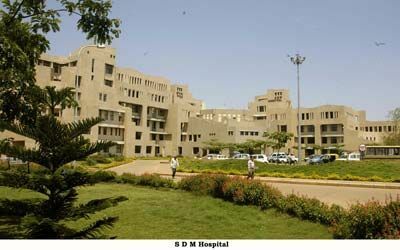 SDM College of Medical Sciences and Hospital, a campus that started in the year 2004. 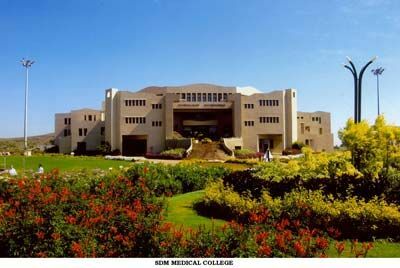 Located 6 kms from Dharwad on the Pune-Bangalore road in a spacious 52-acre land of serene surroundings, the SDM College of Medical Sciences and Hospital complex can boast of an ideal atmosphere for best medical education. No attempt has been spared in providing the best infrastructure facilities needed for an ideal professional in the making. Spacious location away from the noise of buzzing cities, pollution free environment and comfortable natural ambient temperature range of this part of Karnataka state can be an ideal dream of many parents drawn from various locations of India and abroad. Hostels for boys and girls in the vicinity of the hospital and college, suitable timings for library, well tailored timings for classes and studies, facilities for outdoor and indoor games, museum facilities, outlets for extra curricular activities which are allowed at an austere level, all enable the student to take on the burden of the medical curriculum in a balanced manner.